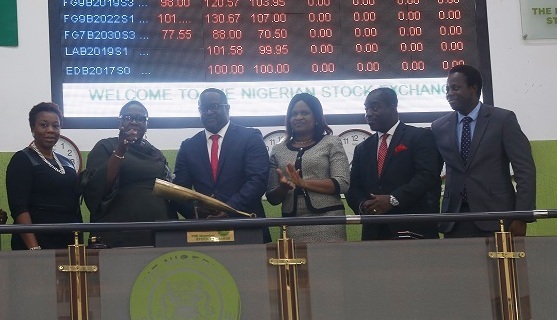 Nigeria's first award winning multi-application electronic transaction switching and payment processing platform, eTranzact International Plc, has trailed the blaze as its Managing Director/CEO, Mr. Niyi Toluwalope beat the closing gong on the floor of the Nigerian Stock Exchange on Thursday. The event, which held at the 8th floor of the Nigerian Stock Exchange (NSE), began at exactly 2:25 p.m. following a meeting between the top management of the two organizations. Subsequent to the brief introduction of Mr. Toluwalope to the stock brokers by the Chief Executive Officer, NSE, Mr. Oscar Onyema, who was represented by the Executive Director, Regulation Division, NSE, Mrs. Tinuade Awe, the eTranzact boss was asked to bring trading to a close by beating the gong. Toluwalope used the opportunity to appreciate the Exchange management for the privilege given to him and his company to play the important role. He said at eTranzact: “We are very experienced in processing electronic payment. He assured the brokers present that the future of eTranzact is bright as investment in it will surely continue to yield rewarding returns. We are sure that all our aspirations will come to realization. Meanwhile, welcoming Mr. Toluwalope to the Bourse on behalf of the stockbrokers, the doyen appealed to the eTranzact management to come back to the NSE soon for the “Facts and Figures” session. The doyen said doing that would further boost the confidence of investors in the shares of the eTranzact International PLC. In their meeting earlier held with the NSE management, Awe stated that the NSE is always happy to welcome its quoted companies at the Exchange; adding that such occasions give room for rubbing minds on things that could lead to the growth of the company involved, especially; and the aggregate economy, in general. Other senior members of management of the eTranzact International that followed Toluwalope for the ceremony are: Mrs. Olayimika Philips, Non-Executive Director; Mr. Olufemi Aminu, Chief Risk Officer; Mrs. Adebunmi Wellington-Ogunlewe, Group Head, Product Development; Mr. Emmanuel Ogunji, Chief Financial Officer; Mr. Adeyemi Adeyemo, Group Head, Financial Services; Ms. Eme Godwin, Group Head, Legal; Mrs. Omowumi Adedurotimi, Company Secretary; and Mr. Adeyemi Opene, Head, Brand and Corporate Communications.